Today is the first day of Spring! Time to celebrate all the verdant vivaciousness of the season with a charming cornucopia of fabulous flowers! Haha! Those really *are* daisies. Gotcha. Yellow and white are so cheerful and springy together, don't you think? ...but believe it or not, those pots are cake, and the flowers are handmade from sugarpaste. Baker unknown - anyone recognize it? I love the colors! And that harlequin pattern is one of the smoothest I've ever seen. Gorgeous! I would guess it's made from gumpaste, so you could display it as a memento afterward. I love pieces like that; as a baker, it makes you feel your work isn't completely temporary. The soft colors are dreeeamy. Imagine the time it took to make each of those little flowers! And I love the textured icing here; sometimes the smoothness of fondant is just a little too modern. And finally, let's go out with a bang. I mean, I know this was for a pair of one-year-olds, but a thirty-something can have one, too, right? Love the one with the support column you could keep. 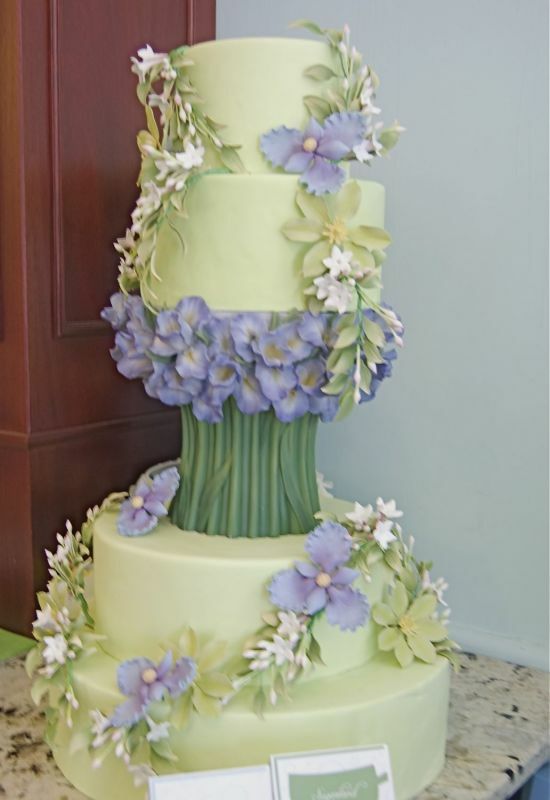 I made gumpaste calla lilies for a cake once and my MIL kept them. She still has them 2 years later! Gorgeous! The flowers look so real! So happy spring is finally here! The calendar lies. I still have like two feet of snow in my front yard. At least these cakes cheered me up! As long as I don't go outside, it's Spring in my mind. The "cameo" strikes me as the prettiest -- subtle, classy, and I love lily of the valley. And those plants in pots are phenomenally realistic. Thanks, as ever, for sharing these with us. 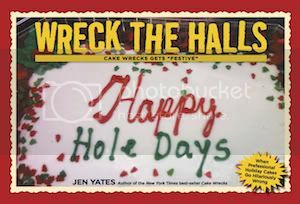 I aught to be cleaning the hause, but I thaught I'd rather give a thauraugh look at Cake Wrecks! My dad and I still have the gumpaste flower bouquets off of his wedding cake 13 years ago. Him for sentimental reasons, me for cake decorating inspiration. 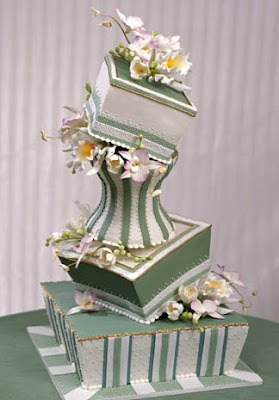 Of course you can have that last cake Jen, just put a 2 in front of the 1 ;) I'm in love with the corset type tier on the white and green topsy turvy one. The one with the little bluish flowers that you said you liked the texture of the icing....take another look. That is piping. 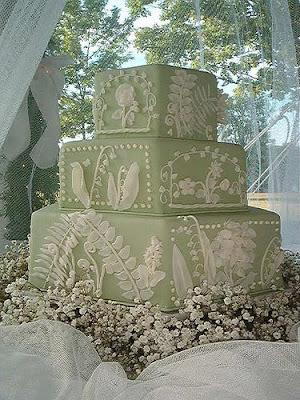 That "Wedgewood" green cake with fern fronds and lilies-of-the-valley has gotta be today's Best of Show. 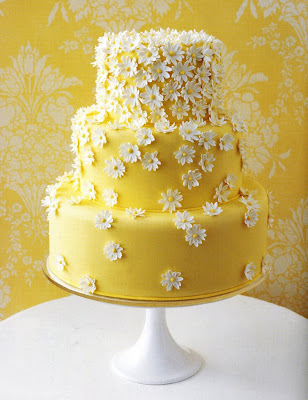 The yellow daisy cake is a picture of Martha Stewart's cake. The exact same one on her web site and book . It's probably a good thing I'm already married, or I would be a demanding bride in the cake department. Gorgeous cakes! I can't decide which one I like best. And loved the daisy reference! mags, if you look at Martha's website, it attributes the cake to Gail Watson. It is the same cake, but it's attributed correctly here. I love how the yellow one does such a good job of reducing the number of daises as it goes down, giving it a cascade effect and really making the daises focal points instead of a dump'o'flowers. One of the rarest skills in any craft is the ability to know when to stop, and that decorator has that down. Bravo. Gerbera and Margerites..not realy...proper Daisy is Bellis perrenis, the common european daisy a perenial grassland plant growing from a rhizome with a rossette of flat rounded leaves. The Gerbera family of flowering plants(there is no such thing as a gerber)are a member of the sunflower family. Marguerite's or ox-eye daisies are members of the chrysanthemum family. WOW! All those cakes are amazing, but I'm especially in awe of the "flowerpots." So realistic! And the topsy-turvy cake is to die for!! All right! I'm a Clara, and my name never shows up on anything--but now I get a daisy cake! WV: Mative--With spring around the corner, the rabbits are particularly mative. Gorgeous Sunday Sweets cakes!! This is one of my favorites! The flower pots are amazing!! Great post! our weather not as spring-y, so those cheerful cakes much appreciated! good stuff, especially fond of the the cake with all the mini daisies. I just love that last one! I don't think I could cut in to it! I can't get over those potted flowers. 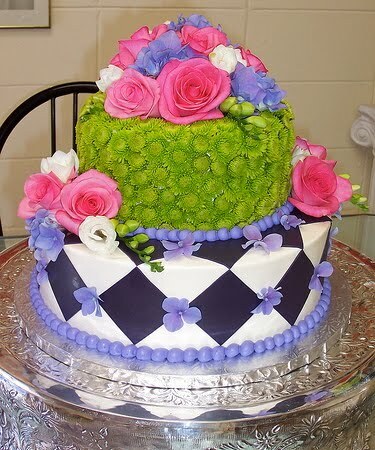 I mean, those cakes that look like potted flowers. WOW. And you're totally right about yellow and white. I don't even like yellow that much, but it's so alive and cheery! WOW. So lovely. The flower pots were stunningly real, but I think my favorite is the muted green and ivory. Or the one with the little blue flowers. Seems like such a sin to eat them. The topsy turvey cake belongs to Scott Clark Woolley. I don't know about anyone else, but I want to see more of the blue and white cake behind the flower pots!!! Can I just say that I look forward to the Sunday Sweets post EVERY week? These are just beautiful & make me forget the rainy craziness going on outside. Yay for spring, yay for Sunday Sweets & Cake Wrecks! I would love that last one for *my* birthday - and I'm 54. :-P Just gorgeous! The first cake is so cute. 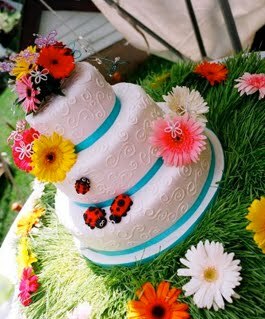 I really like the detailing on the icing and the ladybugs...awesome!! whoops! Maybe if I had read a little bit more I would have saw that . It's one of my favorites either way. There are a thousand websites which refer to them as Gerber daisies and a thousand that call them Gerbera. From what I understand, the genus is Gerbera, the common name is Gerber and either is fine. I would like to point out two things though. They were discovered by a guy named Gerber so calling them Gerber daisies seems to make sense. The genus of a rose is Rosa but everybody calls it a rose. Now, is this really important enough to get upset over? The world is full of conflict and tragedy and we're arguing over an a. They're all great, but I had to hold in a squee when I saw that last picture. Beautiful cakes! The Ron Ben-Israel cake was originally made for my wedding! He liked it so much he did the same cake in a different color scheme...I think it was for a magazine...might have been Martha Stewart's. Here are two pix of my original cake. The honeybees on that last one really put it over the top for me. So adorable! 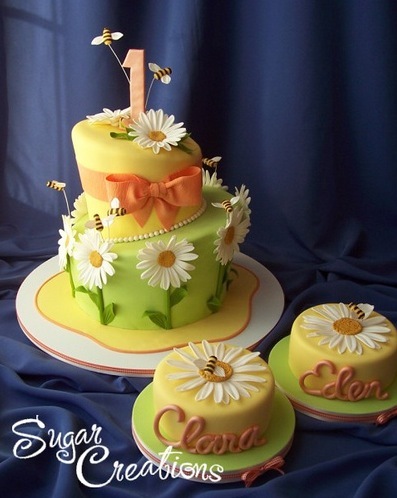 I like the second cake, with the yellow icing and the little white daisies. It makes me so HAPPY!!! I think the cake with the harlequin base has a floral top. I've got a florist friend who makes cakes with teensy flowers inserted in floral foam. and those flowers look like tiny green chrysanthemums. Ahhh such pretty daisies. Makes me wish it felt like Spring here lol. So nice. I'll be happier that spring is here when the weather gets the memo. @Anonymous @ 4:04, I second. @John (thoJ), couldn't agree more. Wreck on! @diddleymaz, I could comment on the misspelling of 'really', but I forebear to nitpick. the Mini Daisies cake may be my favorite of all time. so darling! Love all the gorgeous flowers! Even better looking than real! the number of times the word "daisy" got mentioned at the beginning of the post, I thought it was John posting again about all the various lovely "daisies" found on cakes. Cool! The bakery unknown green one in the net is me! May or may not be confusion with a recent name change; that cake was made when I went by She Takes The Cake at www.shetakesthecake.com but now it is Nonpareils at www.nonpareilscake.com. This was the original She Takes The Cake in New York. Glad you liked the cake and thrilled to have a second cake posted on your Sunday Sweets! Thank for cheering up my Wednesday. Yeah, I know you posted this on Sunday but this made Wednesday happier too. Yellow cake with the small daisies is the opposite of my wedding cake! I had a white cake with yellow daisies! :D SO CUTE! I just love it, and I think it is a pretty popular design!